According to the International Association of Certified Home Inspectors, issues associated with plumbing rank seven on the list of the ten most common household problems. Plumbing refers to any and everything associated with water and pipes within your home. It’s in your kitchen, your bathroom, your basement, and underneath your front yard. With so much potential for problems to occur, one would think the tools and tactics necessary to fix and maintain home plumbing systems would be more accessible to the homeowner. Unfortunately, however, plumbing as a trade is one of those secret societies that have long branded their craft as one with which no average homeowner should dirty their hand. Everyone has a story of a friend who attempted to remedy a plumbing emergency his or herself, making a royal mess of the porcelain throne and the secret magic of its inner workings. In the age of information, however, there are certain things that we just do not need to call a professional for anymore. Most of what you need to know for small fixes in your plumbing is accessible online in the forms of step by step guides or video tutorials. None of these are helpful, though, if you don’t have the right tools. Here is a list of the ten staple plumbing tools you need to solve any minor plumbing emergency. First up on the list is the standard, household toilet plunger. If you don’t have one of these, you need to stop what you are doing and go straight to the nearest hardware store. Like now. 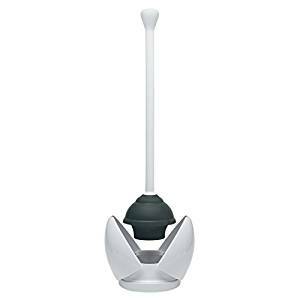 The toilet plunger can be used to clear small clogs in toilets and sinks. Contrary to popular belief, however, there are preferable types of plungers that are better suited to the toilet and to the sink respectively. The flange plunger is shaped to clear clogs in toilets. This is probably the more well-known model. It has a handle and a rubber plunger end that looks like a ball cut in half with the open side facing out. To use it, simply cover the main drain of your toilet with the flange end and press down with the handle to create suction. The cup plunger is basically the same thing, except that encompassed in the half-sphere, flange end, is a smaller rubber cup. This is perfect to fit snugly over those small bathroom and kitchen sink drains. PRO TIP: We have experienced that moment of panic as our toilet water level slowly rises, despite our best efforts with the plunger. Sometimes you need more time than that which the eminent overflow allows. You can stop the water from rising by closing the small valve of the water line that runs into the floor next to the toilet. Attending to plumbing issues, especially in the kitchen, typically means working under the sink, on your back, and around many impediments. This is where the basin wrench comes in handy. Simply put, it is a wrench, used to loosen nuts and bolts in and around the sink basin. What makes a basin wrench different is that the wrench head pivots back and forth on the arm up to a ninety-degree angle. This is super helpful in reaching the small nuts that secure the lines running to the faucet knobs and main drain. What’s more is the claw of the wrench head, the top teeth, so to speak, that close over the nut, is on a tension spring. This means that the claw is always forced closed until the user forced it open by turning it against the ridge of the nut or bolt. An adjustable wrench is the user-friendly alternative to the basin wrench for nuts and bolts to which there is a more clear line of access. The reason you would want to use an adjustable wrench and not just a wrench set, is so you don’t have to keep guessing and checking wrench sizes. It’s just easier. The adjustable wrench looks like a normal wrench but has a knurled thumb screw under the wrench head. You can spin this using your thumb and forefinger to open and close the claws of the wrench head to fit the size of the nut or bolt you are tightening or loosening. 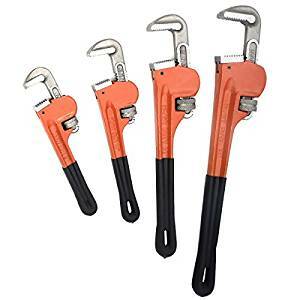 The pipe wrench often referred to as a monkey wrench, is a larger alternative to the adjustable wrench when more leverage is needed to tighten, loosen, and hold fixtures into place. Pipe wrenches are also adjustable. The real added benefit is that they are heavier and longer so you can produce more torque from an awkward, not so powerful position. 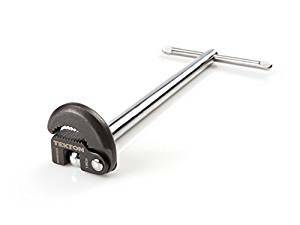 PRO TIP: Where a pipe wrench is needed, you will want to use some sort of cloth or barrier between the wrench claws and the fixture on which you are using it. This is because the pipe wrench is bigger, heavier, and has a more abrasive surface, and can marr or strip fixtures even after only one use. Tongue-and-groove pliers are often referred to as Channel Locks, the brand that most largely produces them. 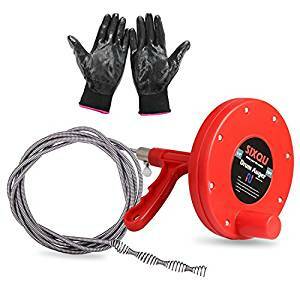 These can be used in place of the other wrenches as a kind of fix all for a lot of the nuts and bolts associated with the plumbing in your home. This tool transcends plumbing, though, and is pretty foundational for many other home fixes and projects. 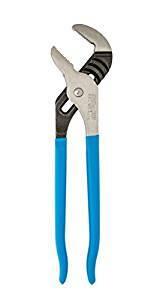 The tongue-and-groove plier distinguishes itself from standard wrench sets and adjustable wrenches , meaning the claw opens and closes to a range of nut and bolt sizes by sliding the two arms open or closed. The jaws of the wrench head are serrated and set up to 60 degrees, which gives the tool its curved appearance. The hacksaw is a type of handsaw made specifically for the purpose of cutting through all kinds of pipes, nuts, bolts, an other. Rather than one fixed blade that emerges straight from the handle, the hacksaw blade is suspended taught across a D-shaped structure, which secures the blade at two points. In this way, the blades are removable. PRO TIP: Store another blade just in case the one being used is not sharp enough. A dull blade will make hard work of what should be an easy cut. If your blade is sharp and you’re still experiencing difficulty, it is likely the it is not suspended taught enough. Tighten it down and you should be good. After those cuts are made along metal pipes, screws, bolts, and nuts, the edges are sometimes rough and jagged. 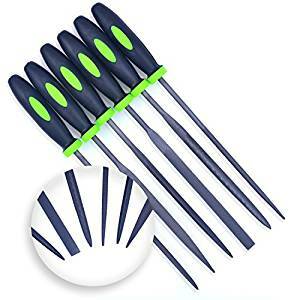 Use a metal file to smoothen them out and avoid any unnecessary accidents and to encourage flush and accurate ends. This is vital to creating tight seals on fitting and pipe joints. The tape is made of a material called polytetrafluoroethylene (PTFE). 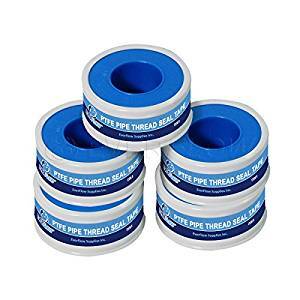 The tape comes on rolls cut to specific widths standard to various pipe thread fitting sizes. Wrapping the threaded edges of a pipe or PVC fitting with teflon ensures a strong tight seal. In fact, most leaks can be fixed with a little bit of teflon. PRO TIP: Teflon is one of those magic materials that can truly be a plumbing fix-all. While it is not always needed, a plumbing lube or WD40 used in cooperation with teflon will make for an even more impenetrable seal. The lube will allow you to tighten the fittings down farther on the threaded edge, putting more space between water flow and pipe structure. When a clog is too much for a standard cup or flange plunger, you may need to use an auger. Typically referred to as a snake, this is a metal wire that is spooked like a hose and enclosed in a plastic or metal case. There is a crank on the side that allows you to deploy the metal wire into the drain. Spinning the crank will not only unreel the wire, it will move the wire in a circular motion so that it is rounding the drain pipe and grabbing hold of any pesky clogs gunked up along the pipe walls. PRO TIP: There are also snakes on the market that have drill bit attachments. You can just lock the bit into the drill chuck and extend and retract the metal wire the same way you drive and reverse a screw or drill bit. This tool is great for those copper and other metal lines that run through places you can’t quite reach with your hacksaw. It looks a lot like the head of a pipe wrench except that the claws are outfitted with small blades. 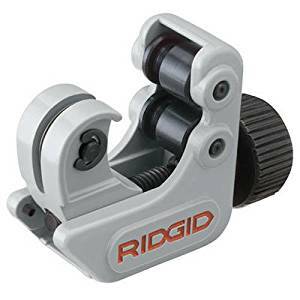 On one end of the cutter, there is usually some type of threaded bolt with a handle that when spun to the right closes the mouth of the cutter over the pipe. PRO TIP: They come in a couple different sizes. The larger ones can be used instead of a hacksaw outside of the area where the tubing is to be fit. This is preferable to some to a hacksaw because it ensures cleaner cuts and less elbow grease. For the purposes of our toolkit, a mini tubing cutter is more essential. 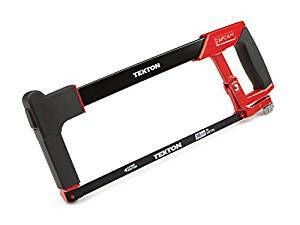 Since we already have the hacksaw, this would be used for smaller tight places where cuts need to be made without removing the tubing first. Small plumbing emergencies happen every day. It would be a real shame to have to call a licensed plumber each time these things occur for lack of tools. Once your essential toolkit is built, you can go as far as maintaining and even improve your plumbing systems with projects such as dishwasher or garbage disposal installation.